Last year, over 82,000 visitors migrated to Miami for Art Basel. Join the dealers, artists and players heading to Miami 2018 from 6-9 December, with the ultimate survival tips from Claire Wrathall & Kristin Ducote. Here they share their insider guide to navigating the turbocharged Miami Art Basel party season. Buckle up and enjoy the ride. 1. Where to Berth Island Gardens: Miami’s newest marina is also one of the best superyacht marinas in Miami. It has a postcard view of downtown Miami and Biscayne Bay and is the only marina capable of accommodating yachts measuring up to 168 metres. Its central location between Miami and Miami Beach makes it an easy starting point if you plan to spend time in both places. Fontainebleau Eden Roc Dock Marina: The annual epicentre of the Miami Boat Show, the marina is ideal if you plan to spend most of your time on Miami Beach as it grants quick access to the beach tents of the Scope and Pulse fairs, as well as the many Faena and Soho Beach House events. However, bridge traffic is difficult during Art Basel so if you want to spend time in the Design District or Wynwood, tender to a site on the mainland and take a car from there. Fisher Island: If you are lucky enough to be a member of Fisher Island (or know someone who is) book a slip in advance for this exclusive marina. 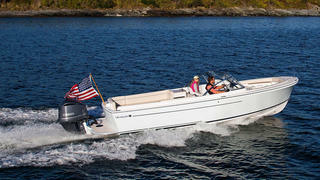 The heady mix of country club and island life is deeply addictive. While the ferry is a bit inconvenient, if you tender to the different areas of the city you wish to visit, Fisher is a great option. Sunset Harbour Yacht Club: Bordering one of Miami Beach’s most up-and-coming neighbourhoods you will find healthy restaurants, small boutiques and gyms just a short walk from your slip. The downside of the marina, which can berth yachts up to 45 metres, is that traffic in the area is dense — so tender to the satellite fairs and restaurants outside this neighbourhood. Last year, over 82,000 visitors migrated to Miami for Art Basel. Join the dealers, artists and players heading to Miami 2018 from 6-9 December, with the ultimate survival tips from Claire Wrathall & Kristin Ducote. Here they share their insider guide to navigating the turbocharged Miami Art Basel party season. Buckle up and enjoy the ride. 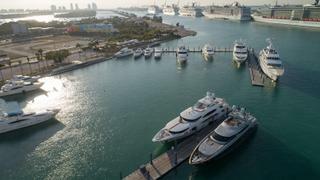 Island Gardens: Miami’s newest marina is also one of the best superyacht marinas in Miami. It has a postcard view of downtown Miami and Biscayne Bay and is the only marina capable of accommodating yachts measuring up to 168 metres. Its central location between Miami and Miami Beach makes it an easy starting point if you plan to spend time in both places. Fontainebleau Eden Roc Dock Marina: The annual epicentre of the Miami Boat Show, the marina is ideal if you plan to spend most of your time on Miami Beach as it grants quick access to the beach tents of the Scope and Pulse fairs, as well as the many Faena and Soho Beach House events. However, bridge traffic is difficult during Art Basel so if you want to spend time in the Design District or Wynwood, tender to a site on the mainland and take a car from there. Fisher Island: If you are lucky enough to be a member of Fisher Island (or know someone who is) book a slip in advance for this exclusive marina. The heady mix of country club and island life is deeply addictive. While the ferry is a bit inconvenient, if you tender to the different areas of the city you wish to visit, Fisher is a great option. Sunset Harbour Yacht Club: Bordering one of Miami Beach’s most up-and-coming neighbourhoods you will find healthy restaurants, small boutiques and gyms just a short walk from your slip. The downside of the marina, which can berth yachts up to 45 metres, is that traffic in the area is dense — so tender to the satellite fairs and restaurants outside this neighbourhood. Fisher Island: One of my favourite anchorages is just south of Fisher Island, and not far from Virginia Key. It’s a choice spot to drop the hook as it’s usually in the lee, has a panoramic view of downtown Miami and there is easy access to the ocean, making it one of the best toy-friendly destinations. Nixon Beach: Located just offshore from the former winter White House compound on the west side of Key Biscayne is Nixon Beach — in fact, a one-acre helipad still exists from the Nixon days. With crystal clear water made for swimming and a nearby sandbar that’s perfect for a stroll during low tide, you will feel secluded from the hustle and bustle but still close enough to tender in for the art fairs. 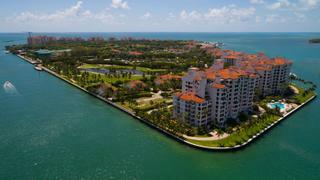 Fisher Island: One of my favourite anchorages is just south of Fisher Island, and not far from Virginia Key. It’s a choice spot to drop the hook as it’s usually in the lee, has a panoramic view of downtown Miami and there is easy access to the ocean, making it one of the best toy-friendly destinations. Nixon Beach: Located just offshore from the former winter White House compound on the west side of Key Biscayne is Nixon Beach — in fact, a one-acre helipad still exists from the Nixon days. With crystal clear water made for swimming and a nearby sandbar that’s perfect for a stroll during low tide, you will feel secluded from the hustle and bustle but still close enough to tender in for the art fairs. Garden Café Just across the street from the convention centre, try Art Basel’s annual pop-up Garden Café, with offerings by award-winning chef Michelle Bernstein. Casa Tua Book in advance for lunch at the iconic, family run Casa Tua, which is less than half a mile from the convention centre, and request a table in its lush garden. Try the tagliolini pasta with crème fraîche and caviar while you rub shoulders with the art world cognoscenti. Matador Room For lunch with a view, book a table at the Miami Beach EDITION hotel’s Matador Room. With a beautiful outdoor terrace under a verdant canopy, it overlooks the hotel’s pool and the Atlantic beyond. It doesn’t get more Miami than this. Coffee Connoisseur Keep an eye out for one of the local Panther Coffee shops and order a “mac milk cap”, an unbelievably strong and sweet cappuccino made with macadamia nut milk. Cecconi’s Cecconi’s atrium, located on the first floor of the Soho Beach House, is one of the best places for Hollywood celeb sightings, people watching and soaking up the hippest strata of the art social scene – and you don’t have to be a Soho House member to access it. However, expect crowds trying to cut through the hotel to the VIP Soho Beach Tent on the sand and a long wait at the valet. Just across the street from the convention centre, try Art Basel’s annual pop-up Garden Café, with offerings by award-winning chef Michelle Bernstein. Book in advance for lunch at the iconic, family run Casa Tua, which is less than half a mile from the convention centre, and request a table in its lush garden. Try the tagliolini pasta with crème fraîche and caviar while you rub shoulders with the art world cognoscenti. 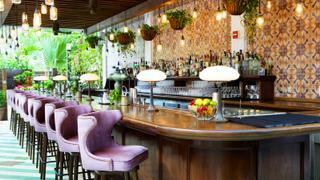 For lunch with a view, book a table at the Miami Beach EDITION hotel’s Matador Room. With a beautiful outdoor terrace under a verdant canopy, it overlooks the hotel’s pool and the Atlantic beyond. It doesn’t get more Miami than this. Keep an eye out for one of the local Panther Coffee shops and order a “mac milk cap”, an unbelievably strong and sweet cappuccino made with macadamia nut milk. Cecconi’s atrium, located on the first floor of the Soho Beach House, is one of the best places for Hollywood celeb sightings, people watching and soaking up the hippest strata of the art social scene – and you don’t have to be a Soho House member to access it. However, expect crowds trying to cut through the hotel to the VIP Soho Beach Tent on the sand and a long wait at the valet. The street scene: When you’re ready for a break from Art Basel Miami Beach 2017, check out the Wynwood Walls and enjoy the best graffiti and large-scale street art from artists such as Shepard Fairey. While there, stop by the vegan Love Life Cafe, where a vitamin-filled, tropical fruit smoothie can help you perk up after last night's partying. Post purchase: Once you’ve blown your art budget, take a walk through the galleries at the Pérez Art Museum Miami and try lunch downstairs at restaurateur Stephen Starr’s Verde — this hidden gem has an emphasis on fresh, locally sourced ingredients and a spectacular view of Biscayne Bay. The street scene: When you’re ready for a break from Art Basel Miami Beach 2017, check out the Wynwood Walls and enjoy the best graffiti and large-scale street art from artists such as Shepard Fairey. While there, stop by the vegan Love Life Cafe, where a vitamin-filled, tropical fruit smoothie can help you perk up after last night's partying. Post purchase: Once you’ve blown your art budget, take a walk through the galleries at the Pérez Art Museum Miami and try lunch downstairs at restaurateur Stephen Starr’s Verde — this hidden gem has an emphasis on fresh, locally sourced ingredients and a spectacular view of Biscayne Bay. Throughout the week, there will be plenty of pop-up parties from international nightclubs including 1OAK, Up&Down and Le Baron. After having hosted Icelandic star Bjork last year, Mana in Wynwood may have something interesting planned again for 2018. For a more sophisticated after-party, try Casa Tua’s private club located above its restaurant, but to get in you need to be a member or be lucky enough to know one. Stick to Miami Beach with its host of extravagant mega-hotel parties, like the Faena Hotel Miami Beach and the Faena Forum, which hosted a Madonna concert in 2016 that raised $7.5 million for charity and featured appearances by James Corden, Ariana Grande, Sean Penn, Leonardo DiCaprio, Chris Rock and Dave Chappelle, as well as a private Bon Jovi concert. It may be worth joining Faena’s private social club, Faena Rose, just for the incredible Art Basel events they throw each year. Also look for ultra-exclusive parties at 1 Hotel South Beach and the EDITION hotel, where rapper Drake performed last year at Virgil Abloh's gig. Throughout the week, there will be plenty of pop-up parties from international nightclubs including 1OAK, Up&Down and Le Baron. After having hosted Icelandic star Bjork last year, Mana in Wynwood may have something interesting planned again for 2018. For a more sophisticated after-party, try Casa Tua’s private club located above its restaurant, but to get in you need to be a member or be lucky enough to know one. Stick to Miami Beach with its host of extravagant mega-hotel parties, like the Faena Hotel Miami Beach and the Faena Forum, which hosted a Madonna concert in 2016 that raised $7.5 million for charity and featured appearances by James Corden, Ariana Grande, Sean Penn, Leonardo DiCaprio, Chris Rock and Dave Chappelle, as well as a private Bon Jovi concert. It may be worth joining Faena’s private social club, Faena Rose, just for the incredible Art Basel events they throw each year. Also look for ultra-exclusive parties at 1 Hotel South Beach and the EDITION hotel, where rapper Drake performed last year at Virgil Abloh's gig. The natural beauty: The northernmost island of the Florida Keys, Elliot Key, is a beautiful place for a day trip to unwind after the hectic festivities. Only 22 miles from the skyscrapers of Miami you will find the epitome of serene Florida topography that’s not to be missed. Launch your smallest tender for a run through the mangroves at high tide and you will be surprised by the plentiful wildlife, estuaries of juvenile fish and beautiful birds. 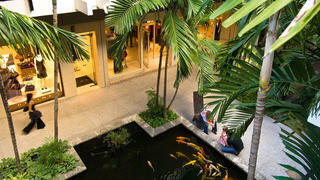 The retail run: Head north to Bal Harbour Yacht Club where a few minutes' drive will take you to luxury outdoor mall Bal Harbour Shops with Prada, Rolex, Loro Piana and much more. Try classic Italian eatery Carpaccio for traditional dishes such as pasta vongole, or head for Makoto where chef Makoto Okuwa prepares traditional Edomae-Sushi with a modern twist. 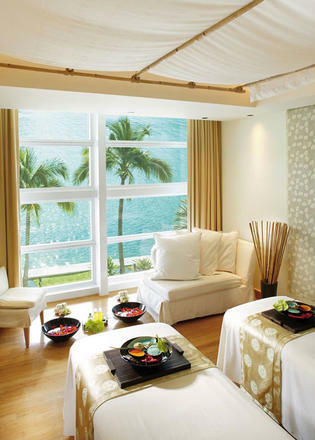 The wind down: After exploring Art Basel’s fairs, treat yourself to a spa treatment. Bamford Haybarn Spa at 1 Hotel South Beach offers holistic treatments, services and classes to help you unwind. Try a Bamford Jade hot and cold stone massage to relax tense shoulders or a brightening platinum facial with Knesko’s diamond-infused face and neck collagen masks. By Sunday you may want to consider a different kind of cocktail. Book an appointment with Dr Steven Schnur, at EliteHealth in the Mount Sinai Medical Center, for a Myers’ general health cocktail IV with an energising glutathione push of concentrated antioxidants and a vitamin D shot add on. The natural beauty: The northernmost island of the Florida Keys, Elliot Key, is a beautiful place for a day trip to unwind after the hectic festivities. Only 22 miles from the skyscrapers of Miami you will find the epitome of serene Florida topography that’s not to be missed. Launch your smallest tender for a run through the mangroves at high tide and you will be surprised by the plentiful wildlife, estuaries of juvenile fish and beautiful birds. The retail run: Head north to Bal Harbour Yacht Club where a few minutes' drive will take you to luxury outdoor mall Bal Harbour Shops with Prada, Rolex, Loro Piana and much more. Try classic Italian eatery Carpaccio for traditional dishes such as pasta vongole, or head for Makoto where chef Makoto Okuwa prepares traditional Edomae-Sushi with a modern twist. The wind down: After exploring Art Basel’s fairs, treat yourself to a spa treatment. Bamford Haybarn Spa at 1 Hotel South Beach offers holistic treatments, services and classes to help you unwind. Try a Bamford Jade hot and cold stone massage to relax tense shoulders or a brightening platinum facial with Knesko’s diamond-infused face and neck collagen masks. By Sunday you may want to consider a different kind of cocktail. Book an appointment with Dr Steven Schnur, at EliteHealth in the Mount Sinai Medical Center, for a Myers’ general health cocktail IV with an energising glutathione push of concentrated antioxidants and a vitamin D shot add on. Come rested and take your vitamins: Art Basel is wild. Days start early with VIP breakfasts at Design Miami or the annual Rubell gallery breakfast installation, and you will get sucked into more gallery hopping and party crashing than you ever expected. By Sunday you will want to treat yourself to vitamin therapy from Elite Health Medical Group or reflexology at the Mandarin Oriental spa, the latter of which is one of the best hotel spas to visit in Miami. Just make sure to book your appointments after artist Kehinde Wiley’s annual fish fry. Wear comfortable shoes: Go for designer running shoes — Valentino’s Rockstud sneakers, Chanel’s colourful tweed version or a pair of Dior Happy slip-ons for walking through the fairs. Bring bug spray and an umbrella: These are essentials — last year’s mid-week deluge was a reminder that the weather doesn’t care about your chic shoes when the streets start to flood. Come rested and take your vitamins: Art Basel is wild. Days start early with VIP breakfasts at Design Miami or the annual Rubell gallery breakfast installation, and you will get sucked into more gallery hopping and party crashing than you ever expected. By Sunday you will want to treat yourself to vitamin therapy from Elite Health Medical Group or reflexology at the Mandarin Oriental spa, the latter of which is one of the best hotel spas to visit in Miami. Just make sure to book your appointments after artist Kehinde Wiley’s annual fish fry. Wear comfortable shoes: Go for designer running shoes — Valentino’s Rockstud sneakers, Chanel’s colourful tweed version or a pair of Dior Happy slip-ons for walking through the fairs. Bring bug spray and an umbrella: These are essentials — last year’s mid-week deluge was a reminder that the weather doesn’t care about your chic shoes when the streets start to flood. 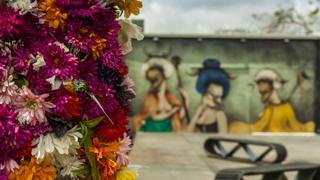 Travel by tender: More than 80,000 people descend on Miami for Art Basel, which means traffic. The best way to travel from venue to venue is via the water. Locals are becoming more dependent on this chic way to avoid traffic, and the idea has even trickled into commerce. Uber has in previous years used its UberBOAT spin-off exclusively for Miami Art Week, allowing users to request boats to ferry them to Art Basel hotspots. All three bridges from Miami to Miami Beach are parking lots during Miami Art Week. Skip the rush and tender in to the boat launch next to Sunset Harbour Yacht Club, which can berth yachts up to 45 metres, a mile from the Miami Beach Convention Center. Before you call a cab, cross the road for breakfast at Icebox Café. Try the lemon ricotta pancakes or southern-style eggs benedict with crab. Stick to one side of the bridge: Another tip to avoid getting stuck in traffic for hours, when you could be rubbing shoulders with the world’s most influential artists and movie stars, is to group your invitations by area and decide whether to spend each night in Miami Beach or Miami. Travel by tender: More than 80,000 people descend on Miami for Art Basel, which means traffic. The best way to travel from venue to venue is via the water. Locals are becoming more dependent on this chic way to avoid traffic, and the idea has even trickled into commerce. Uber has in previous years used its UberBOAT spin-off exclusively for Miami Art Week, allowing users to request boats to ferry them to Art Basel hotspots. All three bridges from Miami to Miami Beach are parking lots during Miami Art Week. Skip the rush and tender in to the boat launch next to Sunset Harbour Yacht Club, which can berth yachts up to 45 metres, a mile from the Miami Beach Convention Center. Before you call a cab, cross the road for breakfast at Icebox Café. Try the lemon ricotta pancakes or southern-style eggs benedict with crab. Stick to one side of the bridge: Another tip to avoid getting stuck in traffic for hours, when you could be rubbing shoulders with the world’s most influential artists and movie stars, is to group your invitations by area and decide whether to spend each night in Miami Beach or Miami.